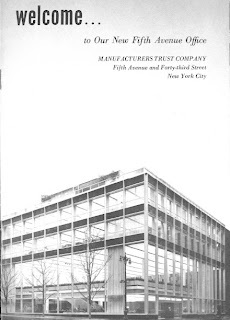 About a month ago, the Landmarks Preservation Commission voted to protect the midcentury modern interior of the Manufacturers Trust bank building on Fifth Avenue. Now owner Vornado wants to do some demolishing and Landmarks said "try again." The Municipal Art Society of New York sent along the building's welcome brochure from 1955, recently discovered in their archives. 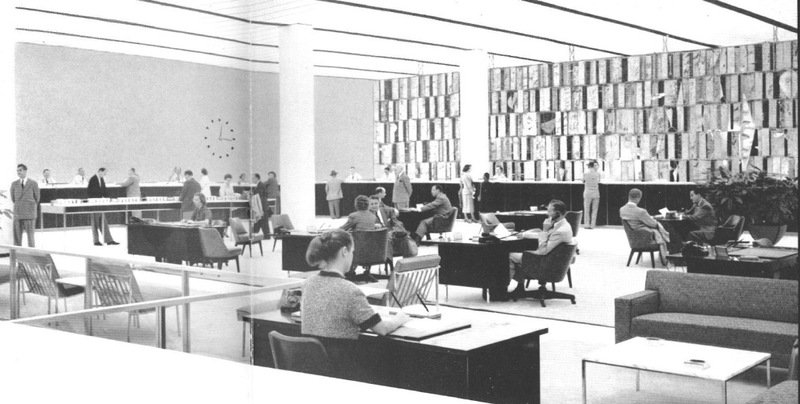 Below, we see a panoramic Mad Mennish shot of the Main Banking Room on the second floor, featuring artist Harry Bertoia's "sculptured metal screen," measuring 70 feet long and 16 feet high, with 800 brass, copper, and nickel panels floating together at various depths. Landmarking came too late to save the "floating screen," which was removed last year by owner JP Morgan Chase against much protest. Here's a closer shot of the screen where "Every customer convenience and comfort amidst stimulating and friendly surroundings is provided for." 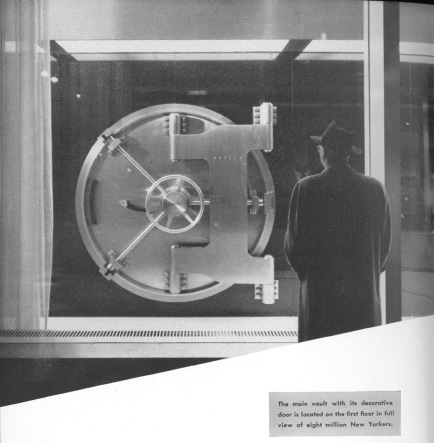 The bank's 30-ton doored Mosler vault is still in the building today, still "in full view of 8 million New Yorkers" on the street level. The brochure tells us that this door is "stronger, heavier and thicker than the two Mosler doors that successfully withstood the atom bomb at Hiroshima." And here's a noirish shot of a man in overcoat and fedora, contemplating perhaps the riches within that not even an atom bomb will access. Finally, a voyeuristic, Hopperesque view of a trio in an office. The man is a visiting out-of-town customer, according to the brochure. He is confident, taking up space with his arm stretched out across the sofa, his briefcase at his feet, fedora and overcoat resting on the opposite arm. The banker's secretary is taking notes. She is in white, while the banker is in dark shadow, not much more than a pair of shoulders and a Brylcreemed head. What happens between them when the curtains are closed? Vornado just fucked up the lobby of my office too. My partner watched the screens taken down and carried away. He alerted landmarks. Apparently they, like the sculptures that were also removed, are considered the personal property of the former tenants, and not part of the leased structure. It's a great shame that such a building as this has been reduced to shilling budget teen wear to tourists. I love that building. When I lived in NYC I worked near it. FrequentlyI would stand across the street and study it. People probably thought I was a well-dressed lunatic or casing the bank. what is now sold there? re: comment mark-"teen wear to tourists"? seems that theres an over dose of teen stores w/the blasting music & all. world wide! i dont get it. are teens are majority? 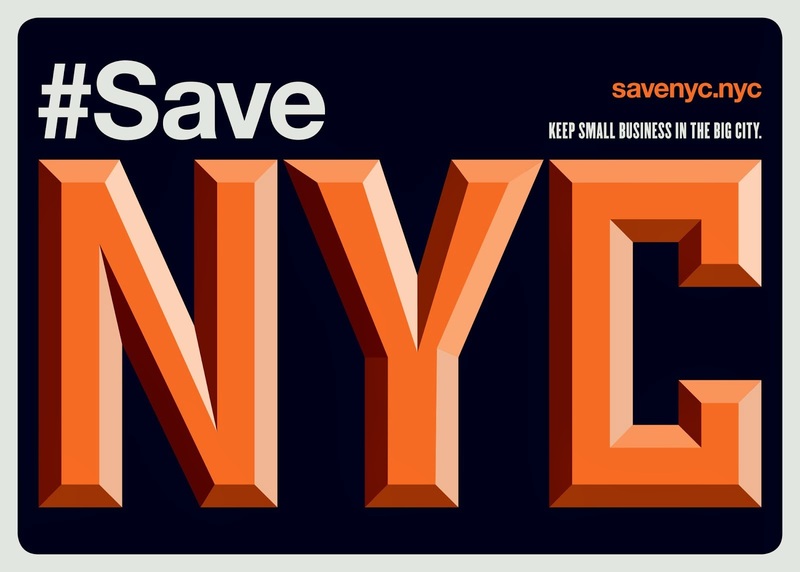 how many of these stores does new york need? guess new york is going down the tubes. i remember when the people who worked in banks could speak english read & write. now they like customer service clerks. there were marble floors in banks. it was nice to go to the bank. like it was nice to go to airports. maybe all this is a result of too much democracy? one world. for all. one size fits all. face it you all, are not part of the "all". throw out those landmarks, dump the sculptures. hello red china. You miss the point. This was the very first bank in which the interior was open to view from the sidewalk. 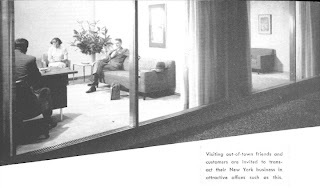 Before this, ALL banks everywhere, including NYC, were institutions with thick walls, windows hidden behind blinds or drapes, with lots of enclosed spaces. That is why this was landmarked in the first place. The bank vault in all other banks was the sanctum of sanctums, hidden from view, either down stairs, or otherwise not visible from the street. So this bank's vault to be visible from the street through floor to ceiling glass windows was truly revolutionary. They are a Canadian concern. Apparently, their clothing was once sold at supermarkets. Glassy buildings aren't the most popular thing around here, but I am glad to see LPC paying attention to stuff like this. andrew: where you responding to my post about the beauty of the old banks? what i meant was all banks (including this one) had integrity. yes this should be a landmark. 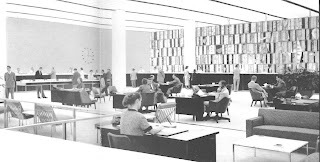 Lower-level Banking Hall (a designated interior landmark!) to be subdivided by wall. (2) New entrances to be poked in Fifth Ave. (landmark designated!) facade. New east-west escalator to be built deep inside building (invisible). Delicate, carefully balanced, original (designated) composition of architectural elements forever lost with the blessings of the NYC Landmarks "Preservation" Commission. 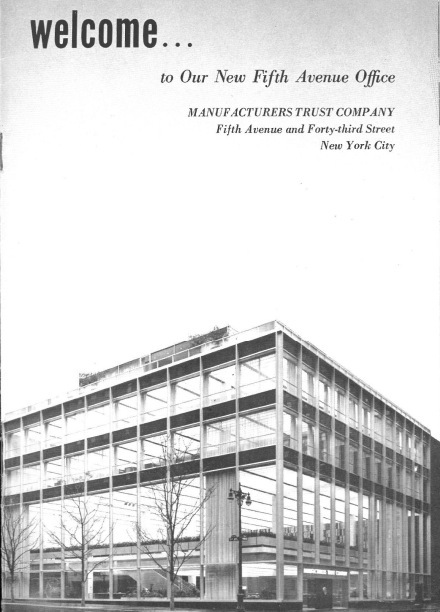 One of the world's classic modernist buildings - destroyed - a calamitous loss for New York.